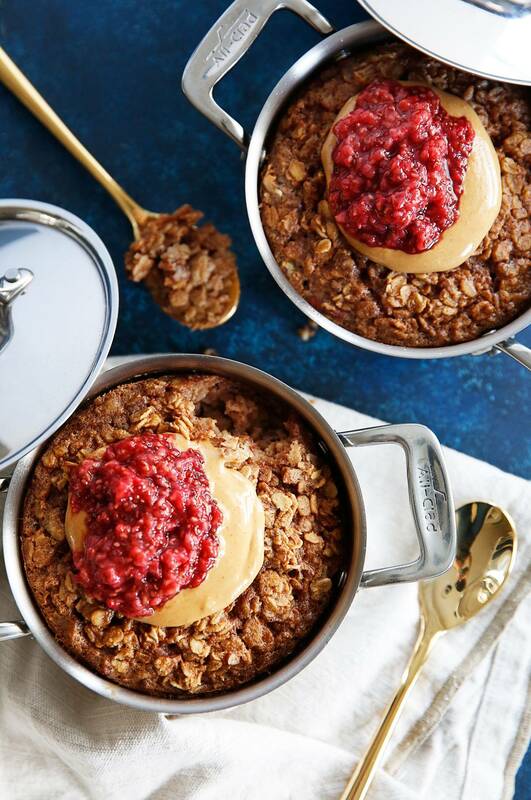 This PB & J baked oatmeal has all the same flavors of a PB&J, but without the traditional sandwich bread. Each bite is a mini PB&J in itself with a more exciting texture and, of course, all the nutritional benefits of its clean ingredient list. 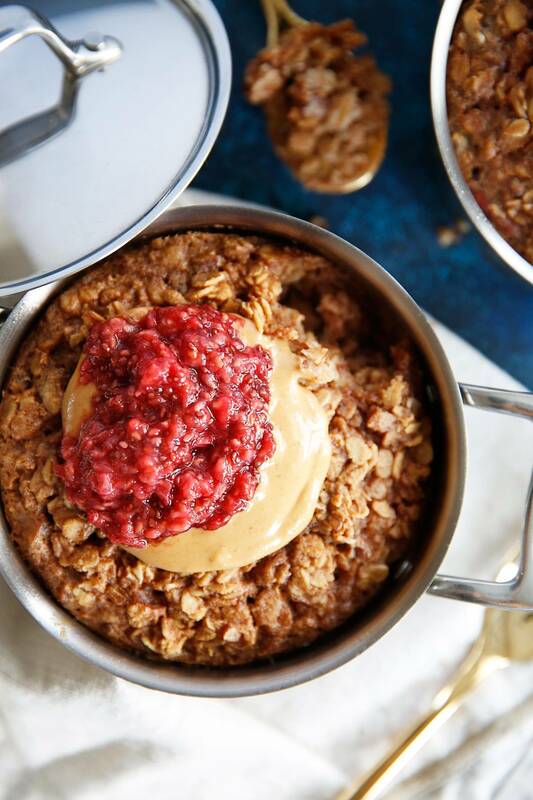 It’s the perfect baked oatmeal breakfast for a weekday breakfast or weekend brunch! 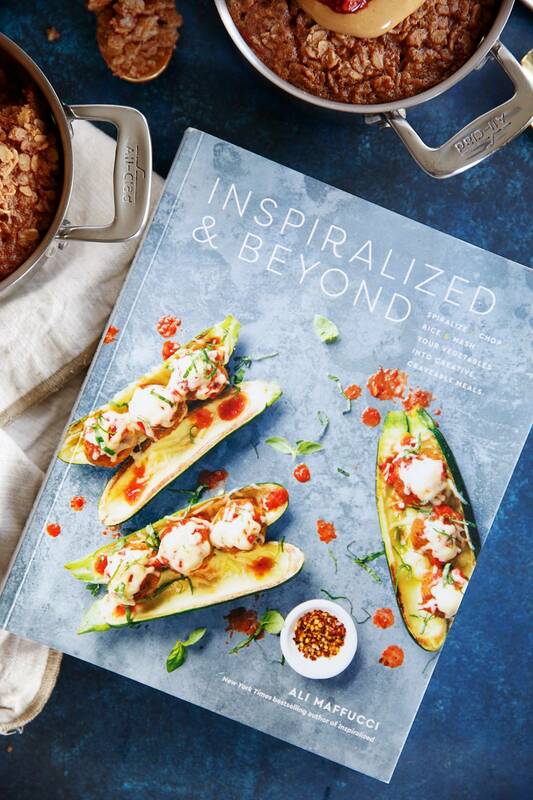 I am so excited to share this recipe from my friend Ali’s newest cookbook, Inspiralized and Beyond! Ali pulled out all the stops in this book, and it was so hard to pick which recipe to recreate and share with you!! In this book Ali shows you a myriad of additional ways to add nutrients to your diet, reach a personal health goal, or just make good-for-you meals at home. Sweet potato slabs replace toast, cauliflower becomes pizza crust, broccoli turns into tots, avocado gets moussed, jackfruit mimics pulled meat—and that’s just the beginning. Among the brand-new recipes, complete with nutritional information, you’ll find Rainbow Lasagna, Apple French Toast, and Cauliflower Steaks with Chimichurri. Rest assured, Ali still offers up some favorite spiralized dishes, too. Get ready to get your veggies on!! How long can you keep baked oatmeal? I keep mine for 4-6 days in the refrigerator! Preheat the oven to 375ºF and grease a 10-inch ovenproof skillet or 9-inch square baking dish with coconut oil. In a medium bowl, toss the oats, walnuts, cinnamon, baking powder, salt, and nutmeg to combine. In a small bowl, whisk together the almond milk, maple syrup, eggs, melted coconut oil, peanut butter, and vanilla. Spread the dry oat mixture on the bottom of the prepared skillet, then pour the wet ingredients over the oats. Tip the baking dish back and forth to make sure the almond milk moves down through the oats. Bake for 35 to 40 minutes, until the top is golden. 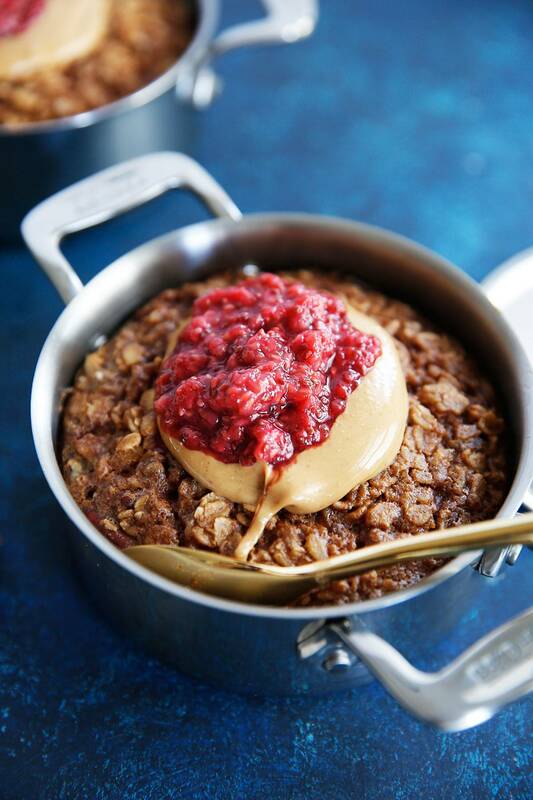 For serving spoon baked oatmeal into a bowl and top with cup chia jam and some peanut butter. Serve hot, with a little more almond milk if desired. Recipe printed with permission from Inspiralized and Beyond! Grab your copy of Ali’s newest cookbook on Amazon here, or anywhere books are sold!! P.S. Check out the Instagram giveaway going on right now on my page (this post) where you can win a copy of the cookbook + AN INSPIRALIZER! Hi! This looks so good! Do you happen to know the total fat content? I see saturated fat. Thank you! YUM! I need to try this, stat. To me, and I believe to many others, this is a new idea of preparing oats!.And I think it’s great! thank you for sharing this recipe …oat meal going to be more cool keep sharing.